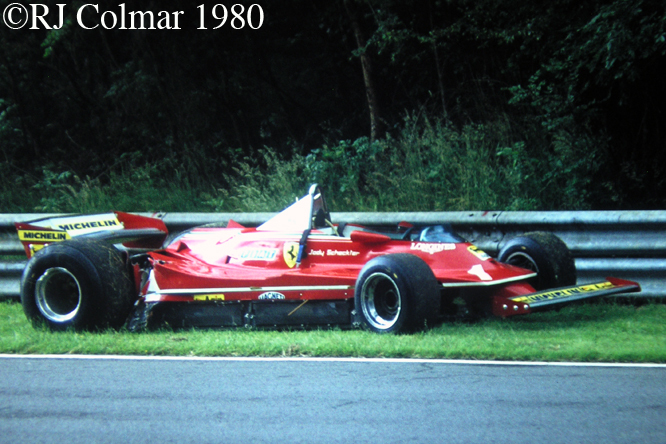 In the autumn of 1972 I was sitting in my dorm at school thumbing through a copy of Autocar when I came across a 4″ x 2″ photograph of today’s featured car the, there was only ever one, Ferrari 312 B3 nick named the Spazzaneve or snow plough. I reached for a pair of scissors and cut the photo out and stuck it to my bedside table where I could see it from my bed and would day dream of driving this compact vehicle to to dozens of Grand Prix victories. Being only 13 at the time and some months away from becoming fully mentally engaged with Formula One, I had no idea that it would be 40 years before I got to see this car in the flesh, partly because it was an experimental model and never raced in anger, partly because it’s designer Mauro ‘Fury’ Forghieri was to be moved to another job soon after #009 was built and tested and partly because Enzo Ferrari was ill which allowed FIAT management at helm of the good ship Ferrari and they wanted Franco Rocchi and Giacomo Caliri under the direction of FIAT’s Stefano Colombo to design Ferrari’s 1973 Grand Prix challenger. 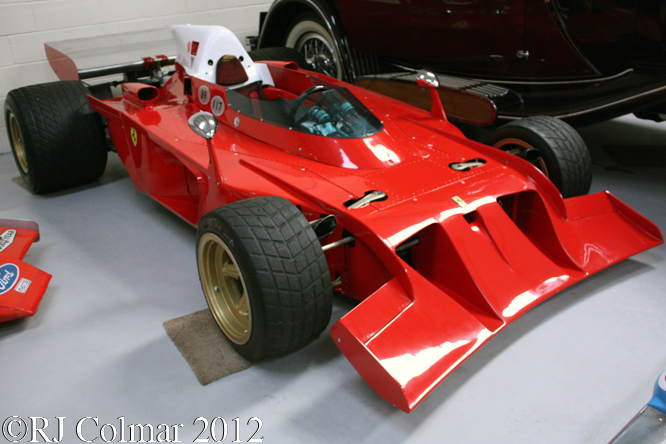 The 312 B3 Spazzaneve was a significant departure from Foghieri’s previous model the not entirely unsuccessful Ferrari 312 B2. Like many designers of the time, including Tyrrells designer Derek Gardner, Mauro was concerned with improving the handling of his cars by packaging all the heavy items, radiators, fuel, oil and water tanks and so forth as close to the centre of the cars gravity as possible. 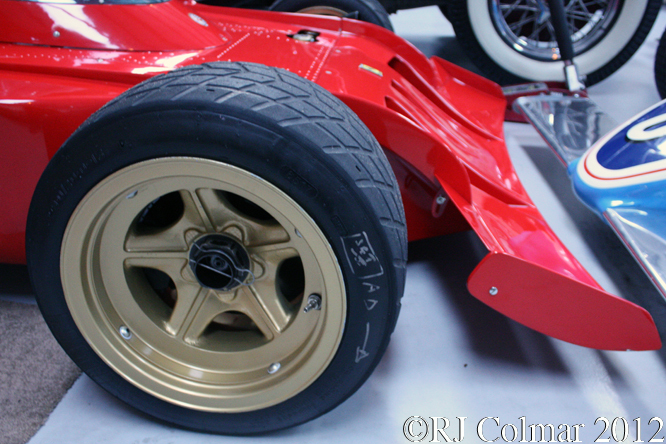 Interestingly this experimental vehicle did not feature inboard front brakes, as did both contemporary Lotus and Tyrrell designs which would have reduced the unsprung weight of the car to the benefit of the handling and brought these items closer to the cars centre of gravity further reducing the chassis ‘polar moment of inertia’ which has the benefit of reducing chassis stresses and improving handling. 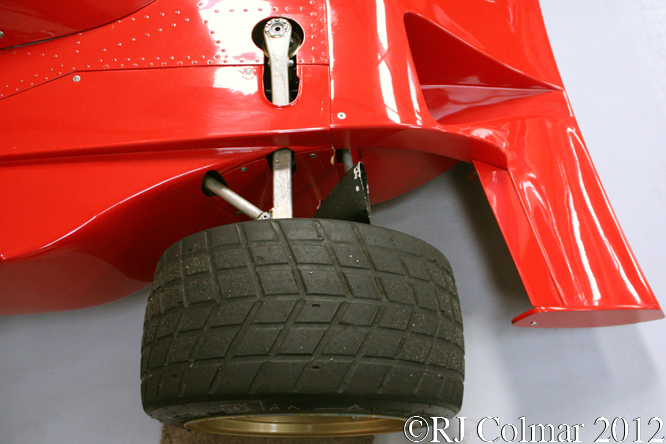 To improve front end grip radiators were mounted behind the front wheels and are fed fresh air by the large NACA ducts in the nose. The hot radiator air was then expelled through the ducts behind the mirror. 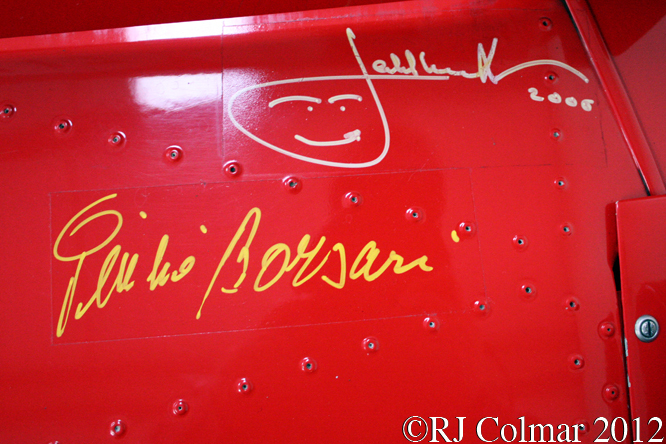 Thanks to GD66 and domenico also at The Nostalgia Forum these signatures have been identified as those of Jacky Ickx, top, and Chief Mechanic Giulio Borsari bottom. I have not seen any photos of Ickx’s team mate Art Mezario driving the car in period, but there is no reason to suppose he didn’t, Art has demonstrated #009 since. 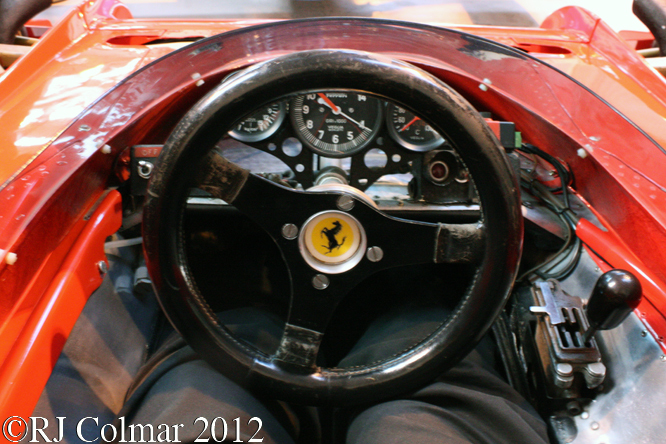 The cockpit for anyone taller than an average horse jockey is incredibly cramped. 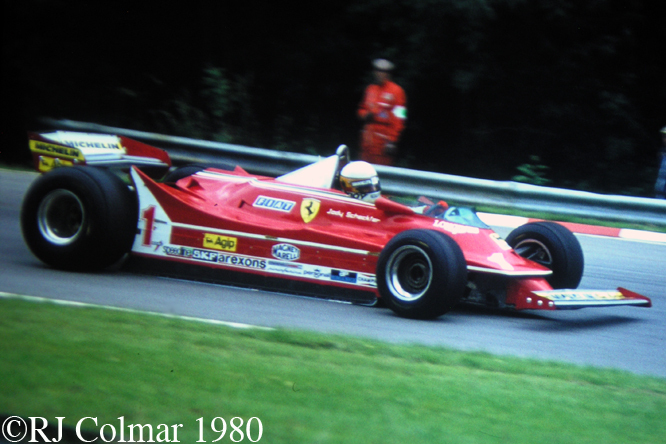 Note the front support has three different anchor points, linked here is a photo of Jacky Ickx driving #009 with the wing mounted all the way forward on square shouldered Firestone tyres, and another of #009 with the rear wing mounted further back on round shouldered Goodyear tyres linked here. Jacky and Art can be seen chatting in the back ground in the latter. 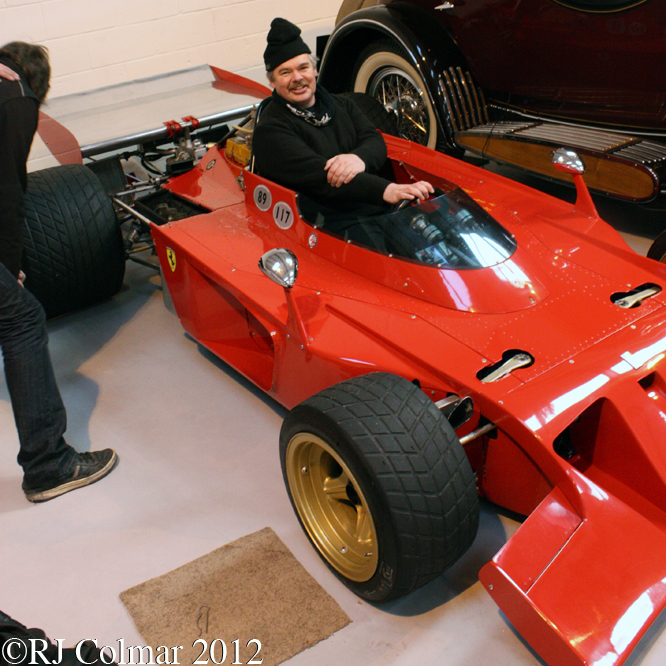 Like Derek Gardner’s Tyrrell 006 design the Spazzanave was found to be very nervous to drive, unlike Tyrrell Ferrari ditched the low polar momentum concept and built 3 freshly designed cars which resulted in Ferrari’s worst season to date, while Jackie Stewart drove the Tyrrell OO6 to his third World Drivers Championship in 1973. 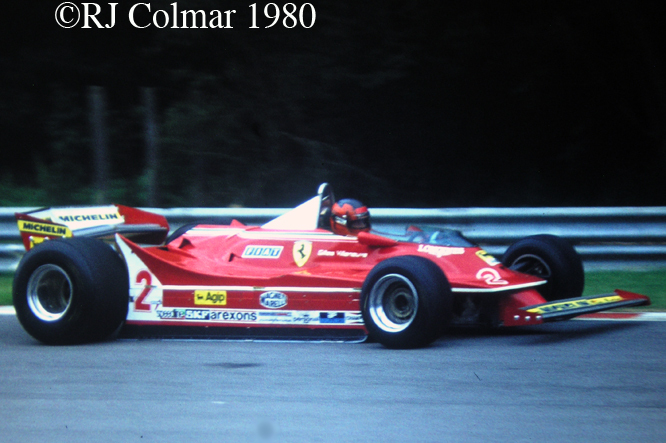 Soon after returning to work in 1973 Enzo Ferrari withdrew his team from the 1973 World Championship for a short sabbatical and recalled Mauro Fogierhi to his former position to rework the 1973 cars with his low polar momentum idea’s. 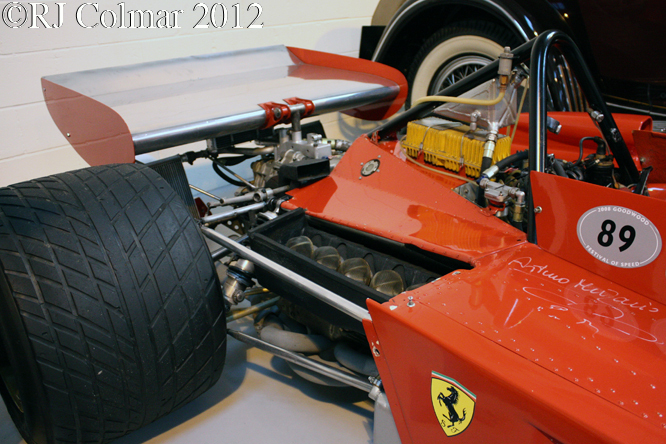 The following season the 1974 version of the Ferrari 312 B3 was developed into a championship contender. Thanks to a touch of galvanic corrosion twixt wheel nut and wheel my school boy day dreams were partly realised while visiting Hall & Hall in Bourne when I was asked to apply the brake pedal in an effort to help free the wheel nuts of the car. Christmas certainly came a couple of weeks early this year. I understand #009 is for sale, unfortunately I do not have the readies to relieve Hall & Hall of the responsibility of looking after Spazzaneve, if you do contact details can be found on this link. My thanks to Ted Walker of Ferret Fotographics for taking me to visit Hall & Hall and to Rick Hall for permission to take these photographs. Thanks for joining me on this “Fury’s Experiment” edition of “Gettin’ a li’l psycho on tyres” I hope you will join me again tomorrow. Don’t forget to come back now ! 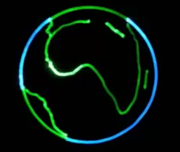 This entry was posted in Uncategorized and tagged 312, B3, Car, Colmar, Experimental, Ferrari, Ferret, Foghieri, Formula, Fotographics, GALPOT, Hall, Hall & Hall, Ickx, Mezario, One, Ralph, Rick, Spazzaneve, Ted, Walker on December 5, 2017 by Ralph. 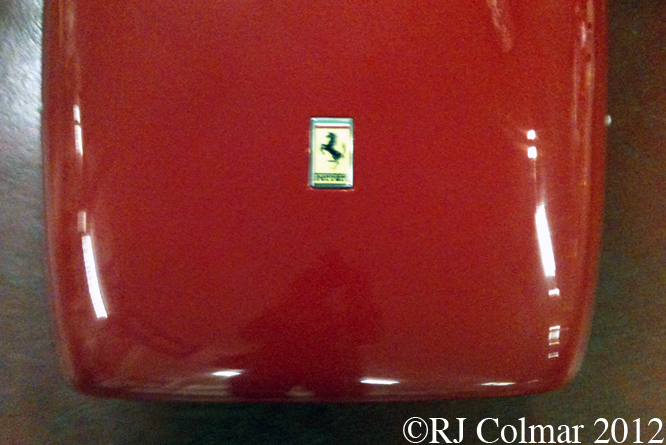 Enzo Ferrari was a man who believed that to remain competitive he needed to start with a good car and then continually seek to improve it’s performance with modifications. 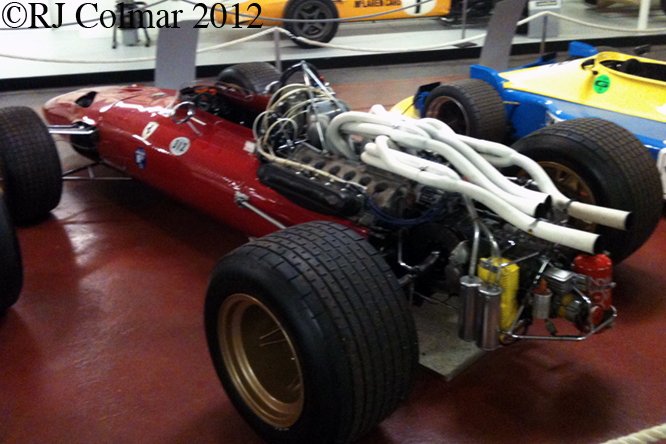 The Ferrari 166/206, following the footsteps of the Ferrari Dino 196S and it’s similarly Dino V6 powered Formula siblings the front engined ‘246’ and rear engined Shark Nose ‘Dino 156‘, perfectly exemplifies his Enzo’s continual modification philosophy. 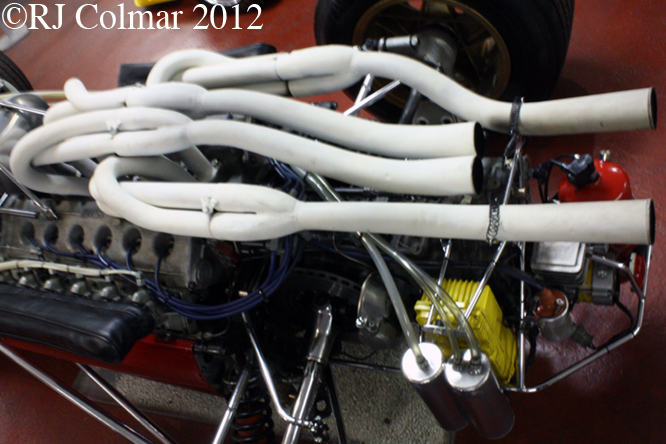 The original Dino 166/P specification of chassis #0834 seen, in these photo’s at Silverstone Classic last year, was built around a new 185hp variant of the Dino V6 with twin overhead cam shafts per bank, quad cam, and twin plug ignition and a capacity of 1592 cc / 97.2 cui. 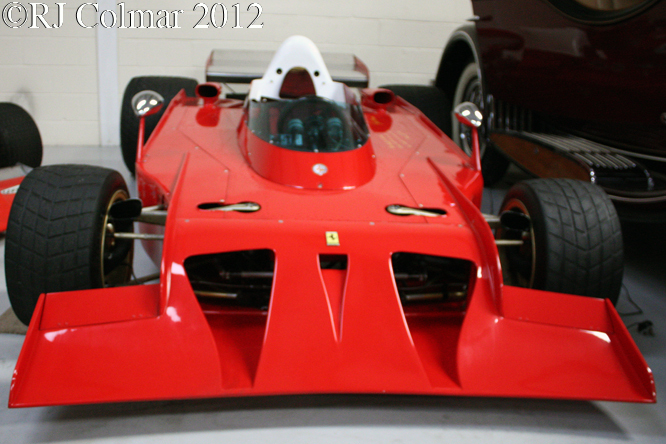 The original body was a closed coupé style, similar to that of a bigger V12 powered Ferrari P2 and can be seen on this link. Despite it’s good handling, in this form the car driven by Giancarlo Baghetti and Giampiero Biscaldi retired from the 1965 1000 kms at Monza after one lap with engine failure, then Lorenzo Bandini drove it to victory at the Vallelunga GP. However the 166/P’s biggest success against much stronger opposition was at the 1965 Nürburgring 1000 kms where Bandini and Nino Vaccarella came home 4th behind two Ferrari P/2’s and a Porsche 904/8 all with larger motors. This performance was thought so unlikely the events scruitineers had the motor stripped to confirm it’s capacity. 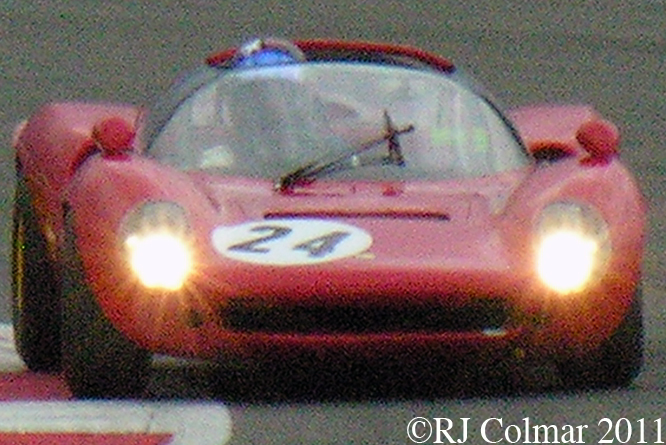 At the 1965 Le Mans 24 hours Baghetti and Mario Casoni only lasted 21 minutes before it retired with a broken valve. 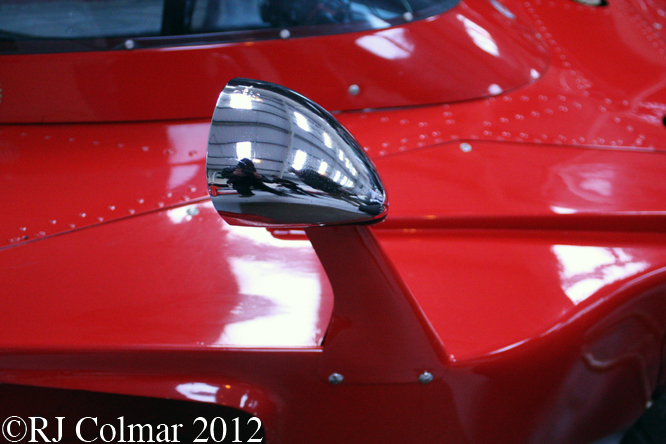 Two months after Le Mans chassis #0834 was upgraded to 206 S/P specification with a 218hp 1986 cc / 121.2 cui Dino V6 motor and a low cut open top Spyder body, which can be seen on this link. Ludovico Scarfiotti used the car in this form to win the European Hillclimb championship setting new course records in all of the remaining 1965 championship rounds. 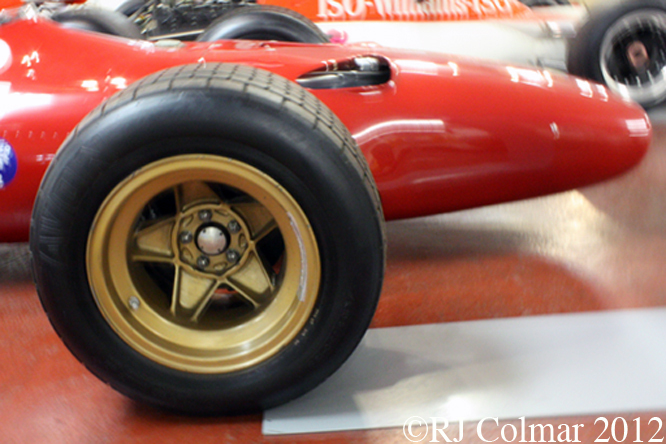 In 1967 the car appeared in the Targa Florio with a third, 206 S, body configuration, similar to the one seen in today’s photographs, where it finished 4th with Jonathan Williams and Vittorio Venturi at the wheel. Two years later Leandro Terra and Turillo Barbuscia drove #0834 still in 2 litre / 122 cui spec to a 25th place finish in the 1969 Targa Florio. #0834 is currently owned by Harry Leventis who shares the driving with Gregor Fisken on a regular basis in the The Italian Historic Car Cup. There is an interesting observation about the “Dino 206” cars by the highly esteemed journalist Doug Nye on this link, makes one wonder what Ing. 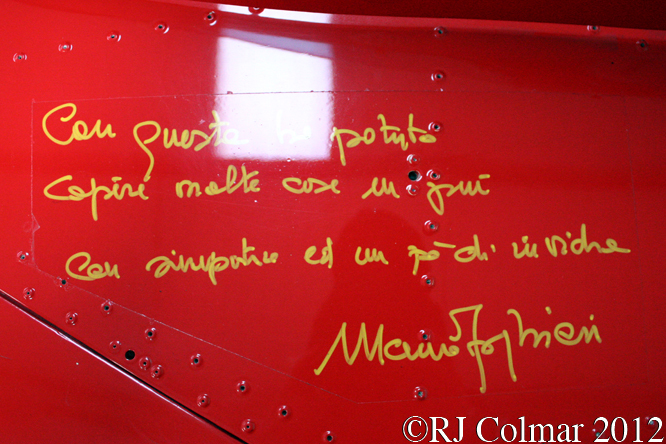 Forghieri may have come up with on a good day ! Thanks for joining me on this “Dino Evolution” edition of “Gettin’ a li’l psycho on tyres”. 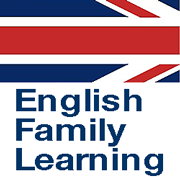 I hope you will join me again tomorrow. Don’t forget to come back now ! This entry was posted in Uncategorized and tagged 166, 206, Baghetti, Bandini, Barbuscia, Biscaldi, Casoni, Classic, Colmar, Dino, Ferrari, Foghieri, GALPOT, P, Ralph, S/P, Scarfiotti, Silverstone, Terra, Vaccarella, Venturi, Williams on June 22, 2012 by Ralph. 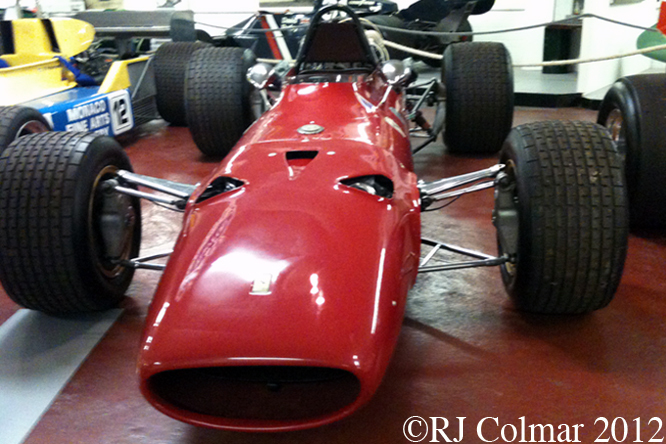 With the introduction of the 3 litre / 183 cui Formula One regulations in 1966 Ferrari not only found themselves unprepared they were also desperately underfunded in part due to Enzo’s withdrawal from a deal with Ford and in part because Ferrari had to spend a lot of money on his sports car programme to try in vane to stop a Ford steamroller from whipping him off the Le Mans scoreboard. 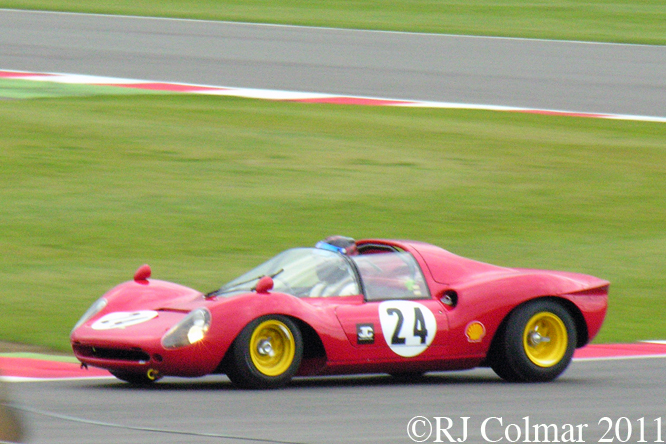 In order to maintain a presence in Formula One under the new 3 litre rules a 24 valve 3.3 litre 201 cui V12 design from the Ferrari 275P2 sports car programme was modified to the meet lower 3 litre / 183 cui engine capacity regulations and installed into the first of a long line of Grand Prix Ferrari’s designed by Mauro Forghieri. 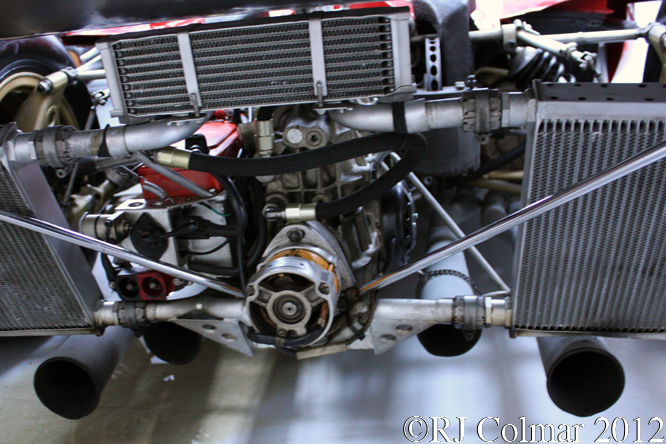 Despite the heavy old sports car engine in the back Ferrari were one of the few teams to have an engine of the correct size when the 1966 season got under way many teams were giving away between 45 cui and 90 cui in engine capacity just to make the grid. 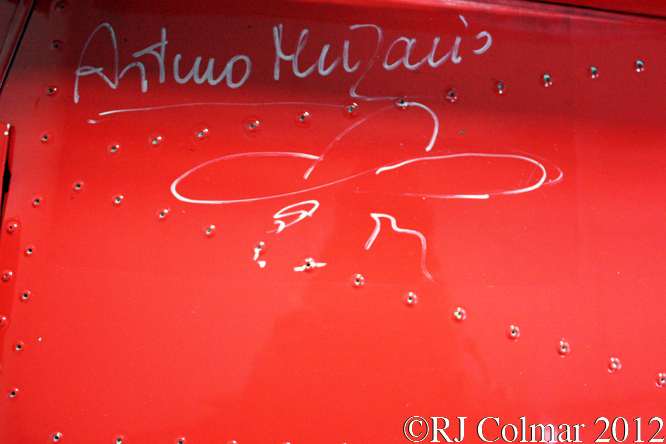 1964 World Champion John Surtees started and 1966 as Ferrari’s team leader but he fell out with Ferrari’s management after winning the Belgian Grand Prix and before starting the Le Mans 24 hours, however Ferrari still finished the season a respectable 2nd in the Constructors Championship thanks to a win in Italy and a couple of second place finishes, beating John Surtees new Cooper Maserati team by a single point despite missing a couple of races. 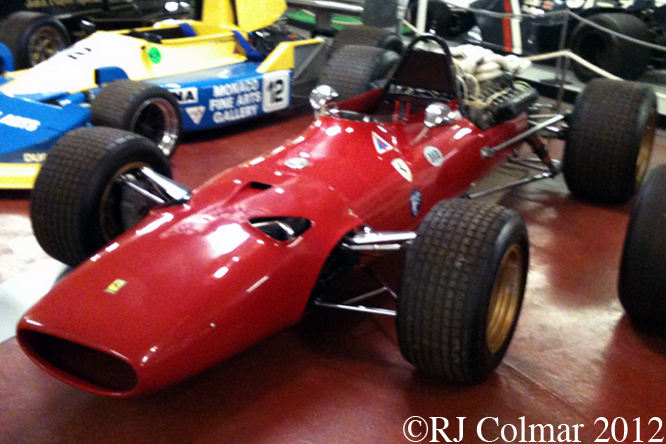 For 1967 the 1966 cars were improved and chassis 0007, seen here recently at the Donington Grand Prix collection, was the last of 4 new Grand Prix cars Ferrari built in 1967, Chris Amon was hired to drive alongside Lorenzo Bandini, at Monaco Bandini qualified 2nd but an fiery accident during the race proved fatal and Chris Amon could only manage a string of four seasons best 3rd place finishes on the way to fifth in the championship for himself and his team, before taking over chassis #0007 towards the end of the season. 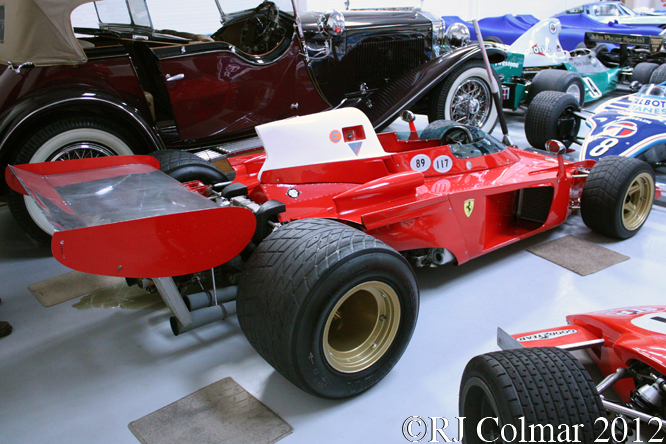 In 1968 0007 was used again by Chris Amon and he won pole positions in Belgium and Holland with it but the season was a disaster for the driver who only succeeded in cementing his reputation as the unluckiest driver in Grand Prix racing with a seasons best 2nd place finish, in a newer ’68 spec 312, and a string of 7 retirements from 11 starts. 1966 Le Mans winner, with Bruce McLaren in a Ford, Chris Amon never did win a Grand Prix despite starting 5 of his 108 Grand Prix from pole position, he has always maintained that he was lucky simply to have survived what is generally considered to have been the most dangerous period in racing, a point starkly backed up by the stat that 8 of the 24 starters in the 1963 Belgian Grand Prix where Chris made his debut did not see out the decade thanks to accidents at the wheel of racing cars. The last person to drive 0007 in period was future sports car giant Derek Bell who started the non Championship Gold Cup and championship United States Grand Prix in this chassis but did not finish either event. Thanks for joining me on the ‘On Luck’ edition of ‘Gettin’ a li’l psycho on tyres’, I hope you will join me again tomorrow. Don’t forget to come back now ! 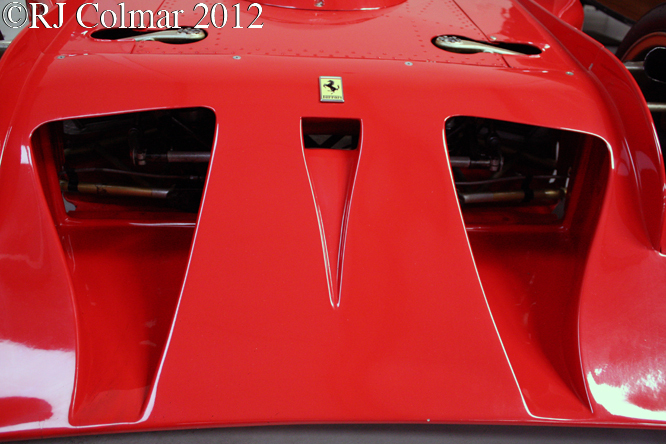 This entry was posted in Uncategorized and tagged 0007, 312, Amon, Bandini, Bell, Colmar, Donington, Ferrari, Foghieri, GALPOT, Ralph, Scarfiotti on March 2, 2012 by Ralph.